The VSA Race Series is on for 2012! The VSA Race Series has been a popular event since it was started in 2004. It has been modified regularly, thus generating increased interest and higher levels of enjoyment, as well as creating a more fair and competitive environment. We will continue to refer to this as The VSA Race Series, but it has always been more that just a race. Race days have always been appreciated as an opportunity to have social events, a day for learning experiences, an opportunity to compete, and a day to experience the many aspects of the sport of soaring. The overall concept for 2012 is to provide a structure for soaring as well as social activities at Williams Soaring Center. On thing that every pilot has agreed upon, is that something like “the race series” was a good thing to have. We certainly tried to come up with the most workable approach we could collectively think of, and I believe we’ve done it. The pros and cons were discussed over the past couple of years, and probably hundreds of private conversations ensued, and here is the latest product. Let’s enjoy. There are a total of nine scheduled race days. Those four that are marked with a star will be regular races, those five without the star will be participation races. About half of the race days will be “regular race days” and the other half will be “participation race days”. A single task will be called on each day. Points from both types of days will be combined and totaled at the end of the season. The pilot with the highest total number of accumulated points for all scheduled days will be designated the Annual VSA Race Series Champion, and will be recognized at the Oktoberfest Banquet. On “regular race days”, the task will be based on the soaring conditions. Everyone who completes the task and turns in a flight log, will receive points. The winner (pilot with the fastest handicapped speed) is awarded 1,000 and all others receive a percentage of 1,000 points, based on percentage of speed below the winner. On “participation race days”, the task will be based on the experience level of the participants. The Contest Director (CD) will call a task that most everyone participating on that day should be able to complete. Every pilot who completes the task is awarded 500 points by the CD. Up to a maximum of an additional 400 points will be awarded by the other pilots using a ballot system. Thus a pilot who completed the task for the day, could possibly receive as many as 900 points for the day (if they received favorable reviews by the other participants) or as little as 500 if the review by other pilots and the CD was unfavorable). A scoring sheet will be prepared while each pilot is flying. Allowing some time for pilots to tell others about their day, and within one hour after the majority of the pilots have landed, pilots will be asked to complete their scoring sheet and hand them to the CD. The CD will tally up all points, including any penalty points and will announce the scores for the day. Dinner will then follow. The flight log must be available, on the VSA Computer for the CD or his representative to review, before dinner, in order for the 500 completion points to be awarded. On all race days, a Pilot Registration sheet will be used. Each pilot must enter his/her glider model and handicap. The data base of turn points, including the location of the start and finish gates, is available on the internet, published by John Leibacher on the Worldwide Soaring Turnpoint Exchange, located at http://soaringweb.org/TP/NA.html#CALIF The data file for the 2012 VSA Race Series is called “wsc12”. 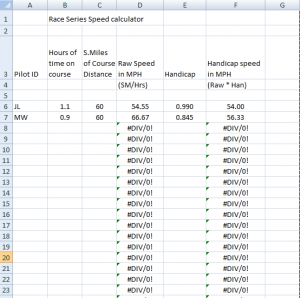 An assigned speed task (AST), in which the race is defined strictly by speed will normally/ routinely be used because of the simplicity of scoring and the impracticality of using a grid launch system at WSC. The CD may also assign either a modified assigned task (MAT), in which pilots pick their own turn points, or a turn area task (TAT) in which a sequence of various sized circles, which pilots must fly in order. Either an MAT or a TAT will be used if and when necessary, but ONLY IF a scoring official is available, and it appears that the scoring will be completed before dinner. For AST: Total distance used for speed calculations will be the same for all pilots and will be from the center of each reference (start, finish, and turn point). The start and finish points will each be a five mile radius cylinder. A one mile radius cylinder will be used around each turn point, and the flight trace must show that the pilot passed within one mile of each point. Timing begins and ends at the five mile arc around the start and finish points. There will be a maximum height to the start cylinder of 10,000 feet MSL. There is no upper or lower limit to the finish cylinder. The CD, at his/her discretion, may apply a penalty to a pilot’s score for infractions regarding safety or sportsmanship. After the flight, each pilot is required to submit his flight log to the scoring official (if available), or upload his flight log to the VSA computer and, on “regular race days” enter his/her raw speed on the Participation Roster. The CD will review the score sheet, and will be the final approving authority for all points awarded on that day. Participants will enter their name, model and handicap on this sheet before flight. 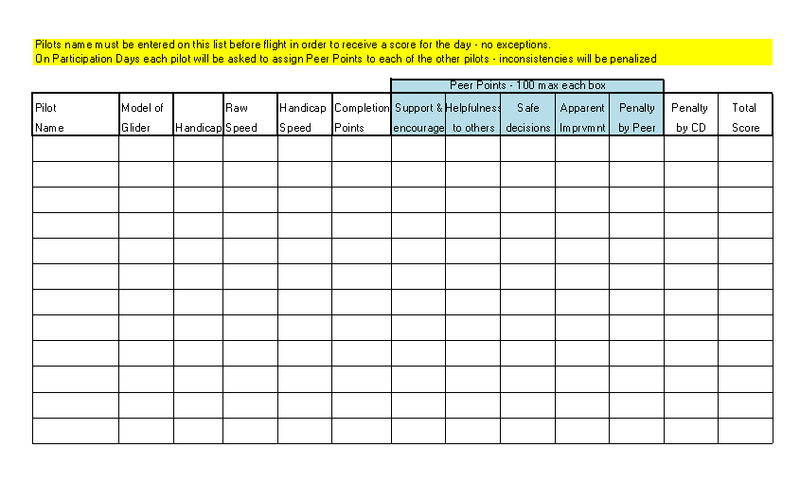 On “participation race days” each pilot will be provided with a copy of this sheet and asked to assign peer points to each of the other participants. All points will be included in the total number of accumulated points, which will be used to determine the VSA Race Series Champion for this year. After landing, each pilot must report their total time on the task – from the time they started to the time they finished. The VSA computer is available for this task if needed. Go to the Race directory on line to download the calculator (in old or new file version). The Registration/ Score form is also available on this link.